Ubisoft has been more supportive of Nintendo's Wii U than most of its peers, but the company has also remained wary of the console's weak commercial performance. In a recent interview, Ubisoft CEO Yves Guillemot sounded more doubtful than ever about the prospects of selling his hit Assassin's Creed games on the Wii U. 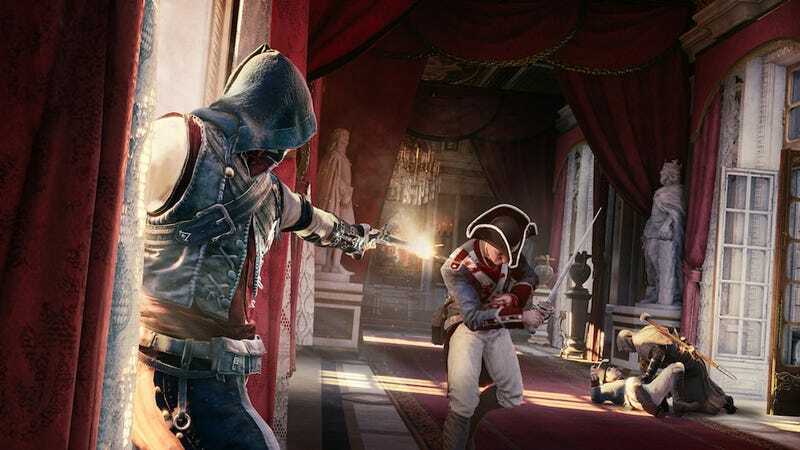 Speaking to Game Informer in an interview from Gamescom, Guillemot said that Assassin's Creed, consistently one of Ubisoft's most popular games and a flagship franchise, barely sold on the Wii U last year in comparison to other platforms. "What we see is that Nintendo customers don't buy Assassin's Creed," Guillemot said of the last fiscal year that ended March 31, 2014. "Last year, we sold in very small numbers." Game Informer added that sales of Wii U games only accounted for three percent of all sales for the fiscal year—down a percentage point from 2013. Wii sales, meanwhile, accounted for 11 percent of software sales over the same period. Ever since the Wii U came out in 2012, Ubisoft has been one of its most ardent supporters when it came to making cross-platform or even exclusive games for Nintendo's latest console. But the company has started to change its tone in response to the Wii U's weak sales. Back in June, Guillemot said that Ubisoft was sitting on a pile of unreleased Wii U games. His more recent comments to Game Informer onlymake the future of these games sound all the more ambiguous. Guillemot also told Game Informer that while the games his company is bringing out this year are still "fine for the PS3 and 360," they're planning to jettison last-gen compatibility starting in 2015. "But next year because they are selling very quickly, we'll move to the new hardware," Guillemot told Game Informer. "After 2015, it will be hard for us to create games for those systems." I want to be careful not to over-speculate here and thus needlessly indulge in the console war's horse-race. Guillemot's comments about last-gen hardware don't necessarily relate to anything he said about the Wii U. But remember when Warner Bros. announced that Arkham Knight won't appear on the Xbox 360, PS3, or the Wii U. Kotaku's Kirk Hamilton noted that Arkham Knight is still more of an exception than the general rule, of course. But if a major publisher like Warner Bros. is already lumping Nintendo's newest console in with Sony and Microsoft's last-generation hardware, it can't be a good sign for the Wii U's future prospects either. This is all subject to change, however. Ubisoft didn't say anything about future plans for Assassin's Creed on the Wii U—just that it hadn't sold very well so far. Also, the company is still working on a version of Watch Dogs for Nintendo's console. So the Wii U still has some good stuff in store for it, and could get even more if Nintendo figures out a way to boost its sales.